Zero carbon means the wholesale price is zero. Public discussions about future energy markets revelations are unexpected: there is no place for Power Trading in the low carbon future, even for such an advanced one such as Peer-to-Peer. In fact, power trading, that charge consumers in $/kWh for how much they consume, loses it means as the “protector of commons” in balancing supply and demand. In power systems dominated by (almost) zero variable cost energy sources like wind, solar, or nuclear there is simply “no marginal value” to be charged to customers as $/kWh, unless there is a constraint on the grid. The Figure 1 visualizes this transition happening at the German Market: during high renewable penetration, the competitive price goes to zero or even negative values. Power becomes abundant. Thus consumers are paid to consume more to avoid imbalance. However, even when power generation is scare, the worth of the wholesale power trading is close to nothing compared to total costs of supply. 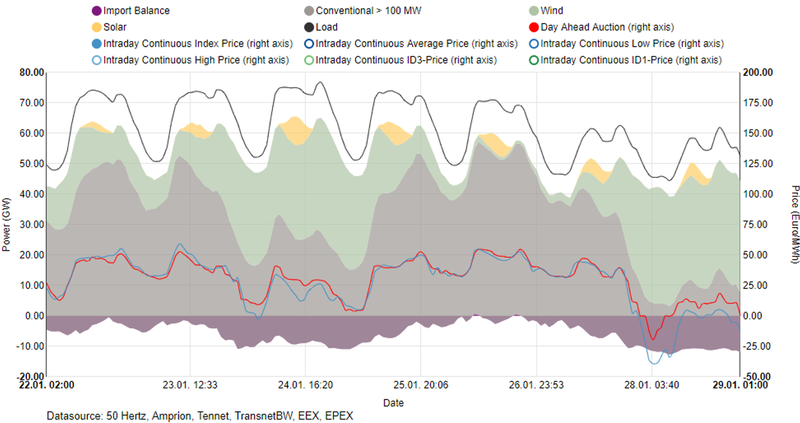 The reason is that over 80–90% of energy supply costs are fixed and so are not subject to competitive forces within the current market model (mind the vast difference between average wholesale day-ahead prices for 2015–2017 of 28.2–32.9EUR/MWh and retail fees of 295.0 -305.0 EUR/MWh in Germany paid by households, including T&D, green fees, security reserves, tax and other system management costs). Deeper renewables penetration will increase power system fixed costs close to 100%. So, we may not need power trading at all: neither Wholesale nor (what a surprise) Peer-to-Peer, which is broadly promoted by some Blockchain Energy teams as a breakthrough remedy. This remedy is like trying to rebuild an old “steam engine” with 3D printing, thus a mindless repeating of old business models with new technology. The explanation is simple: low variable costs means that end users may by charged Flat Rate power tariffs like lump sum internet access fees or even get Power For Free. There is no surprise that in particular, Germany is already trialing this novel “sounds like a theory only” concept with one of the home battery leaders Sonnen offering SonnenFlat tariffs to its community for quite some time. As the energy becomes abundant, generating stochastic and fixed costs, it is apparent that new market models are needed to balance the system focused on flexibility. Thus when and how energy is consumed, presumed or generated, instead of how much. There are reasons to expect, that precisely here in Flexibility Trading, defined as the right to consume for the time of constraint as $/kW and so by changing or rewarding market participants for energy taken and supplied to the grid during times of constrains, blockchain is capable of delivering value. Distributed ledgers allow fully structuring allocated P2P flexibility pools, where every connected device may call or offer flexibility to others, maximizing the value of the shared economy of distributed energy resources across the globe. This transition has still to be digested appropriately across incumbents and new entrants of the industry to afford a truly sustainable energy future.